The WindFloat is fitted with patented water entrapment (heave) plates at the base of each column. The plates improve the motion performance of the system significantly due to damping and entrained water effects. This stability performance allows for the use of existing commercial wind turbine technology. In addition, WindFloat's closed-loop hull trim system mitigates mean wind-induced thrust forces. This secondary system ensures optimal energy conversion efficiency following changes in wind velocity and direction. The WindFloat project is said to be the first offshore wind deployment worldwide which does not require the use of any heavy lift equipment offshore. All final assembly, installation and pre-commissioning of the wind turbine occurred on land. Furthermore, this could be the first offshore wind turbine in open Atlantic waters, and the first deployment of a semi-submersible structure supporting a multi-megawatt wind turbine, Principle Power says. Following pre-commissioning of the system onshore at the Lisnave facility near Setubal, Portugal, the WindFloat offshore wind turbine solution was loaded-out using a dry-dock and towed 350 km offshore. Over the next few weeks a rigorous commissioning, testing and startup procedure will be completed. This will include trial operations and a phased ramp-up in power production to full capacity. "This is an historic moment that takes your breath away," says Alla Weinstein, CEO of Principle Power. "In a way we are making a similar leap towards new energy resources as the Oil & Gas industry did in the 1970's when it began using floating structures. Further, we have proven the capabilities of the Portuguese maritime industry to adapt and provide the necessary resources to successfully fabricate and deploy an offshore structure of this scale. We [Principle Power] look forward to future business and success in this and global offshore wind markets with our innovative WindFloat." "The (deep) ocean is the next big energy frontier," adds António Vidigal, CEO of EDP Inovação. "Deep offshore wind technology, in particular the WindFloat, will allow us to harness stronger and more stable winds, and in the medium term deliver sustainable energy into our electrical system. Now is the time for extensive testing and validation, moving forward in the development of this promising technology. 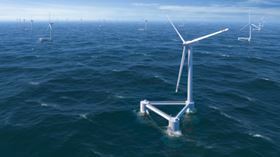 The WindFloat positions EDP on the leading edge of offshore wind exploration." WindFloat is the result of continued hard work by all WindPlus JV partners including: EDP, Principle Power, A. Silva Matos (ASM), Vestas Wind Systems A/S, InovCapital, and Fundo de Apoio à Inovação (FAI). In addition over 60 other European vendors participated.